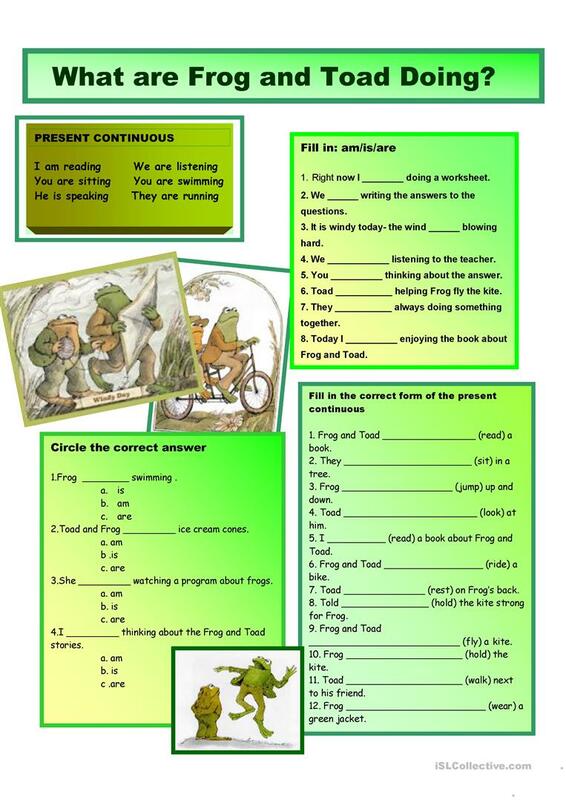 Use the characters Frog and Toad from the classic children's books to practice the present continuous affirmative tense. Talk about what they are doing. Use the book- if possible- as an aid. Then complete the worksheet- focusing on the correct usage for each person. The above downloadable worksheet is meant for high school students, elementary school students and adults at Elementary (A1) and Pre-intermediate (A2) level. It is valuable for revising Present continuous (progressive) tense in English, and can be used for improving your groups' Writing skills. It is focused on the vocabulary topic of Animals. kifissia is from/lives in United States and has been a member of iSLCollective since 2011-10-12 07:37:58. kifissia last logged in on 2019-04-19 15:40:50, and has shared 385 resources on iSLCollective so far.